Plywerk Holiday Gift Guide - New York City! Last week, we started off our local holiday gift guide series with our hometown of Portland. However, we realize that many of our customers live elsewhere. It’s difficult to pin down where most of you are, but statistically speaking, New York City is probably a safe place to start. We’re big fans of the Big Apple, and have spent many sleepless nights dreaming of the City that Never Sleeps, so basically we feel very qualified to write a gift guide about it. But seriously, we’ve got some some cool stuff to check out here for those of you find yourself gift shopping in Gotham. First off, naturally, is a membership to MoMA (that’s the Museum of Modern Art—are you impressed yet?). We have a strong connection to the art world, and MoMA is the preeminent destination for exploring, observing, and learning about the art of our time. Memberships carry a huge value, including free admission to MoMA, free films, discounts, and more. You can also buy dual and family memberships for huge savings. Secondly, treat your special someone to a custom illustration by Plywerk customer, Jason O’Malley. As one of the “best 200 illustrators worldwide,” Jason’s work has appeared in numerous high-profile publications, including Vogue and the New York Times, and now has the opportunity to alight upon the wall of your friend or loved one’s esteemed home gallery (no doubt mounted on one of our bamboo or maple art panels.) Thirdly, pay a visit to Kaight in the Boerum Hill section of Brooklyn. With an emphasis on sustainability and local production, Kaight is a women’s clothing store after our own heart. They also carry jewelry, bags, shoes, and other accessories. Whether you’re shopping for your girlfriend or your mom, take a look at Kaight. They are fair-trade, organic, and incredibly awesome! Fourthly, Area Kids is the place to shop for all the youngsters in your life. Started in 2005 with the mission of being a source for eco-conscious clothes and toys for babies and children, the store now has 9 locations. They also have a great selection of art supplies for the young, aspiring artist and future Plywerk aficionado. Fifthly (is that a word? ), Brooklyn Industries is an exemplar of green business and they deserve your money. We’re not joking here. They started, quite literally, out of a dumpster when the founder noticed some discarded billboard material could make a nice messenger bag. Now, they sell all manner of bags, clothing, and accessories with a heavy focus on eco-friendly production. Alright, Portland and NYC are down; that leaves just about 100 million to go! This entry was posted in Gifts, Holiday Gifts on November 30, 2014 by admin. Don’t worry, we get it: you’re thinking the last thing you want for Christmas is another tree ornament. It’s just going to get put away in a box in a dark cupboard until next year, crammed in there with all the other ones. But what if there was an ornament that you could actually love? One that would gracefully adorn your tree every winter, but that would actually want to be able to look at year-round? 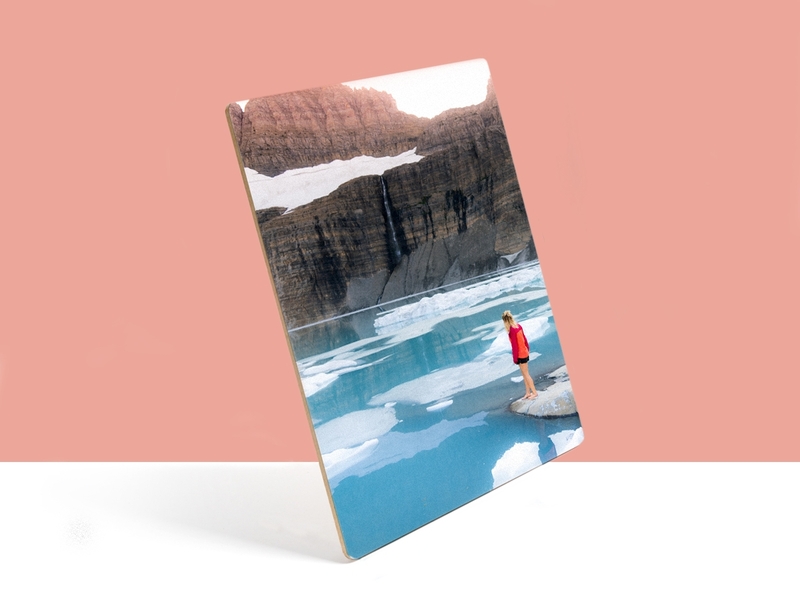 Well Plywerk custom photo ornaments are exactly what you’re looking for. 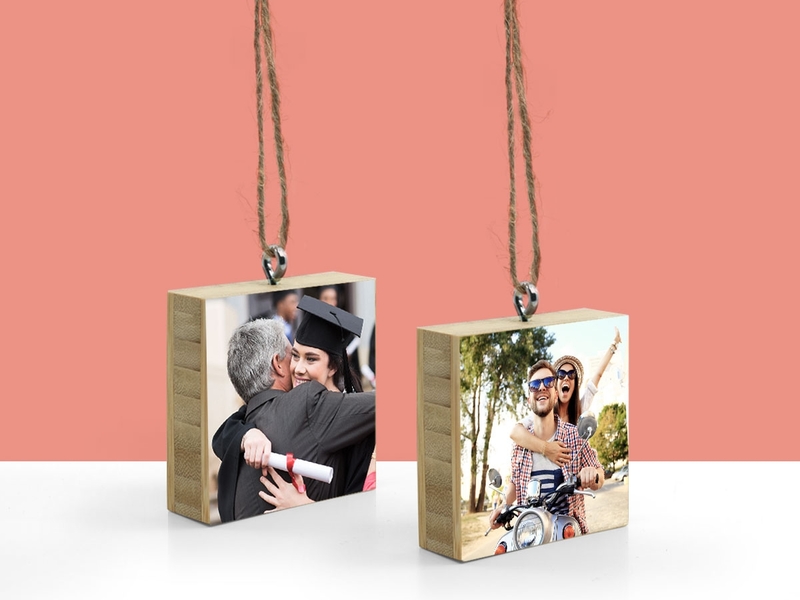 Made from our sustainably-sourced bamboo in a 2.5” square, custom ornaments are a great way to show off your favorite pictures and memories. Every detail has been thought of to ensure your ornament looks perfect hanging on your tree, and each receives the same multi-round hand-sanding techniques as our larger bamboo and maple art panels. They are finished with a strong, stainless steel eyelet and decorative organza ribbon for easy hanging. Ornaments, like all Plywerk Minis, make great gifts and stocking stuffers for friends and loved ones, who will undoubtedly cherish the memories they display for years to come. And luckily, Plywerk ornaments aren’t limited to the holidays—find a place to hang them, be it a rearview mirror or over a kitchen window, for year-round enjoyment! Buying an ornament is as easy as uploading your photo, selecting the crop, and clicking submit. And don’t forget about Gift Your Order, our eco-conscious gift wrapping service—we’ll even include a custom hand-written note for the recipient. This entry was posted in Gifts, Holiday Gifts, Photo Display Products on November 27, 2014 by admin. At Plywerk, we don’t just make the world’s best bamboo custom picture frames. We also run a highly-advanced economics research lab where we seek to answer the biggest questions in consumer shopping trends. Take, for example, Black Friday. Long considered to be (somewhat falsely) the busiest shopping day of the year, Black Friday receives a lot of hype; but now there’s a young contender stepping up to the plate to challenge its dominance: Cyber Monday. Considering the fact that we’re e-commerce enabled and have no real need of throngs of savage customers charging through our doors at 12:00 AM the day after Thanksgiving, we thought it would be fun to run a little competition between the two greatest shopping days of the year. Here’s the deal: whether you shop Black Friday, Cyber Monday, or the regular ol’ Saturday and Sunday in between, we’re giving you 17% off your Plywerk order with coupon code PLYGIFTS. This is a purchase you can make from the comfort of your armchair, clad in oversized sweatpants, leftover apple pie in hand, any time from Black Friday through Cyber Monday. Hold up, there must be a catch! Well, there is (not really): by placing your order with the PLYGIFTS coupon code during this period, you are aiding our consumer research efforts and helping us determine which shopping “holiday” is the best. Submit your order on Friday or Saturday to cast your vote for Black Friday. Order on Sunday or Monday, and we’ll chalk up a point for Cyber Monday. Got it? So in review: order your Plywerk photo gifts any time from Black Friday through Cyber Monday to save 17%, and cast your vote for the best shopping day of the year. Your work is invaluable to our research, which will undoubtedly influence the creation of future photo display products. Or something. This entry was posted in Gifts, Holiday Gifts, Photo Display Products on November 26, 2014 by admin. At Plywerk, we devote a great deal of our mental faculties to figuring out how to work more efficiently and reduce our impact on this planet. For example, all our photo display products rely on bamboo, maple, or walnut woods, and we work to ensure they are all sustainably harvested. Stanley is made completely with upcycled Western Walnut and an all-natural oil/wax finish, and we recycle our own scrap wood as much as possible—including making keychains out of it for Green Drop Garage. Keychains for Green Drop Garage made from our bamboo scraps! But running a green workshop is only half the story. After we cut, sand, and mount your pictures to our custom frames, we also have to get them to you. We can say all we want about our sustainable production, but if we deliver the final product packaged in non-recyclable materials, that kind of defeats the purpose. In 2011, we switched from using bubblewrap to sustainable Geami GreenWrap, which is 100% recyclable. This alone has saved roughly 40,000 square feet of bubblewrap from entering the ecosystem since 2011. We also source most of our boxes and other packaging materials locally from Carton Service, which even provides many supplies that are made from surplus materials. Here are a few examples of how we ship eco-friendly! One of the more difficult materials to replace with a green alternative was freezer paper, but thanks to EcoWrap we now have a freezer paper that not only resists moisture, but is 100% recyclable. EcoWrap also comes courtesy of a local company: Pac Paper in Vancouver. Of course at some point, the boxes need to be loaded onto a truck and driven to their destination, which means C02 coming out of a tailpipe. While we offer local pickup so that our Portland customers can strap their Plywerk to their bikes, that doesn’t work as well for our out-of-town customers. That’s why we purchase carbon-offsets for all our UPS shipping, which ensures that for all the carbon put into the atmosphere to deliver our products, an equal amount of carbon is reduced elsewhere in the world. While carbon-offsets are not a cure-all, this is a verified, audited process, and we feel confident using it to support our eco-friendly shipping procedures. There is, of course, a third part of the equation—you. We work as hard as we can to be more than just green, but we are always looking for ways to improve. If you have ideas for how we can improve the eco-friendliness of our production and shipping practices, then we want to hear from you. This entry was posted in Behind the Scenes, Eco-Conscious, More Than Just Green on November 25, 2014 by admin. Here’s another great use for Stanley, our upcycled Western Walnut picture display stand that is proving to be much more than just a classy alternative to a picture frame for holding holiday photos. We’ve already shown you some of the other uses for Stanley, and now we’re back with something entirely new, a holiday recipe display idea using non other than our own Stanley! We understand this isn’t obvious at first, but Stanley’s unique design and crazy-strong neodymium magnets allow him to easily hold just about any paper-based material—not just photographs. By inserting a recipe where the picture would normally go, you can instantly transform Stanley into a recipe display stand. Are you with me? Yeah? Now, there are two great reasons to use Stanley to display recipes. The first is to let Stanley help you in the cooking and baking process by holding your recipe upright. This reduces the counter space, or footprint, required for the recipe, keeping it out of the way of your working area while still being easy to reference at any moment. Depending on your kitchen layout, you could even use just one half of Stanley to magnetically hold your recipe to any applicable surface, like your refrigerator. The second use is to invite Stanley to your holiday party, where he will happily display Grandma’s famous apple pie recipe right next to the pie itself, so your guests can decide whether or not they want to live dangerously by consuming that much sugar that night. In fact, invite a few of Stanley’s friends (who are also conveniently named Stanley) to show off the recipe for each dish. Guests will marvel at your culinary expertise (“Ooh, I didn’t know you put kale in this!”) while also being able to discreetly avoid any unwanted ingredients, like gluten and animals. So now that you have even another use for Stanley, go ahead and visit the li’l guy in our store. He’s been looking for a home just like yours! This entry was posted in Holiday Gifts, Photo Display Products on November 24, 2014 by admin. If you’ve been hanging around this here Plywerk blog recently, then you’ve seen how Stanley has been making the news quite frequently. We previously spoke of Stanley’s adeptness at displaying photographs at a wedding, and also threw in the idea of using him to display the dinner menu. But what if you're looking for a stylish menu display idea, and you’re not at a wedding? Well guess what? Stanley still wants the job! Happy Hour Menu from Pacific Pie Company! That’s right, the little picture stand that could is expanding into new markets. No longer satisfied with simply putting your memories on display in your home or at your wedding, now he’s squarely positioned himself to take the professional business sector by storm. Are you a restauranteur with a flair for the classy? Have you been searching for a table display that is both stylish and makes it easy to switch out regularly-changing happy hour and specials menus? Do you have an opening for a maitre d’? Well then Stanley is the man for you. Table Top Menu from Pacific Pie Company! Stanley’s upcycled western walnut with eco-friendly wax finish exemplifies our dedication to the environment, but also presents a dark, distinguished appearance, which Stanley will tell you is merely a surface-level manifestation of his inner wit and sophistication. He fits in nearly anywhere, and is just as comfortable suggesting a hot sauce at a sports bar as he is recommending wine pairings to foreign dignitaries. His small footprint won’t impede dinner table conversations, and his neodymium magnets offer a secure way to hold your rotating tap list upright, yet make it a breeze to switch out when needed. He’s also available in three different sizes, to accommodate different types of content, from upcoming live music performances to seasonal desert menus. So much more than a picture stand, Stanley is a great way to add some custom decor to accent the mood of a restaurant, brewery, or café. 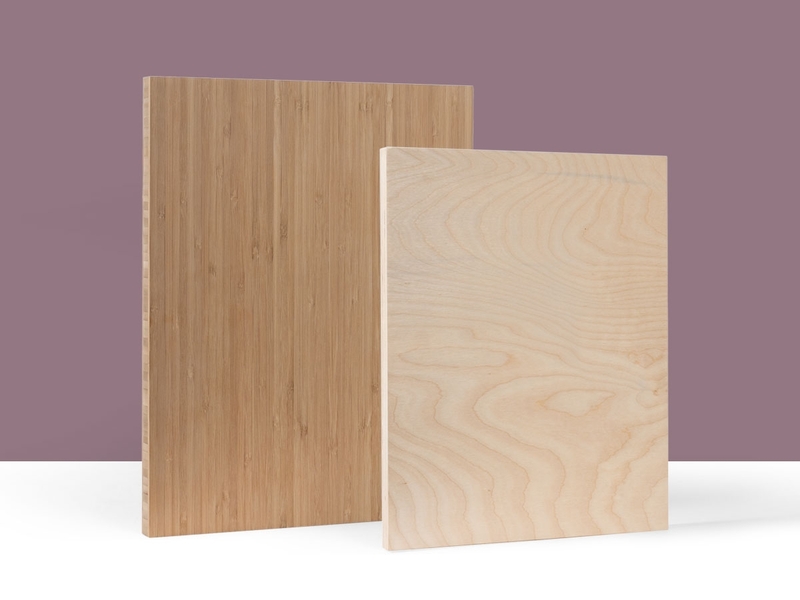 Pair him with an elegant Plywerk bamboo art panel wall display for maximum effectiveness. In the years I spent as a wedding photographer, I came across many fun ways to display photographs at the ceremony and reception, from simple picture frames, to photo books, to cardboard cutouts of the bride and groom. A wedding offers a rare opportunity for entire families and groups of friends to be together, and is the perfect time to put your memories on display. And Stanley, the newest addition to our Plywerk family, is a simple and elegant solution for doing exactly that. As its name suggests, Stanley is an easy-to-use photo stand, consisting of two wood blocks held together by some crazy-strong magnets. It is incredibly easy to transport and set up, so it’s great for weddings when time is of the essence. Use it to display those embarrassingly-cute baby pictures of the bride and groom, photos from the engagement shoot, or just about anything else. (You could even use Stanley to display the timeline or dinner menu—now that’s thinking outside the frame). Like all of our photo-mounting solutions, Stanley represents our unflinching commitment to the environment. Available in three sizes, it is made from sustainably harvested and upcycled Western Walnut courtesy of The Joinery right here in Portland, OR. It is then hand-finished with an all-natural oil/wax blend, giving it a rich and beautiful surface so that Stanley looks its best on your wedding day. Stanley is the easy-to-use, sustainable, and elegant custom photo display stand that will look right at home at your wedding. So what are you waiting for? Go ahead and introduce yourself. This entry was posted in Eco-Conscious, Handmade in Portland, Photo Display Products on November 22, 2014 by admin. Tired of stacks of greeting cards piling up on your counter? Having trouble finding a creative way to display your seasonal dessert list? Have you met Stanley yet? 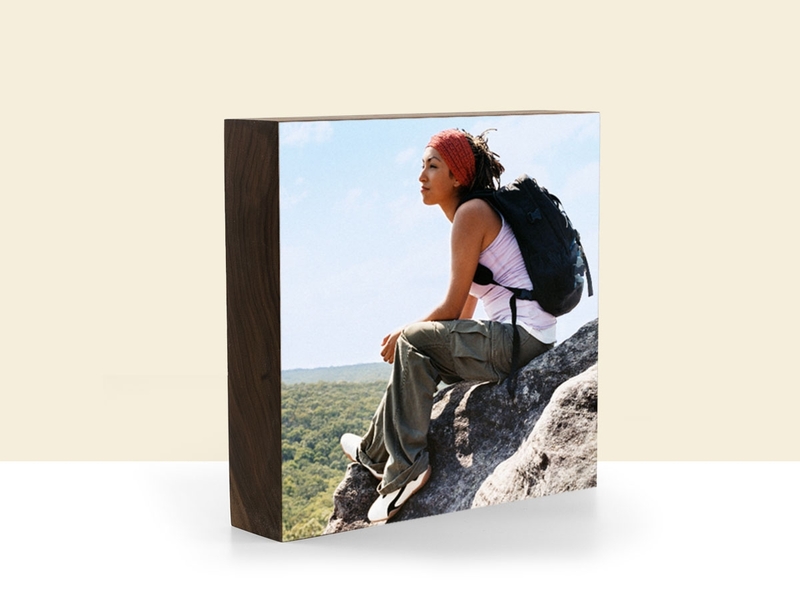 If so, you already know about the sophistication, classy appearance, and incredible versatility of this upcycled Walnut picture display stand. If not, then allow me to highlight some of his most important attributes to illustrate how Stanley is the perfect holiday art display. You see, Stanley is made from high-quality, sustainably-sourced Western Walnut, and finished with an all natural oil/wax blend (it’s even safe enough to gnaw on, although we don’t recommend it). He also looks fantastic, but he’s not just decorative. Using crazy-strong neodymium magnets, Stanley can easily hold any piece of printed material upright, and makes it easy to switch out prints over time. This not only means he is perfect for displaying holiday pictures, but also for greeting cards, Christmas carols lyrics, or even seasonal menus at a restaurant. Stanley is so much more than a picture display stand. He’s a proud example of our commitment to the sustainable production of eco-conscious picture frames and other display products. And, he’s the perfect companion to your mantel, tabletop, bedside table, or anywhere else you’d like to display a changing selection of seasonal content every year. Available in three sizes, Stanley will scale nicely to whatever task you present him with, from holding the latest family photo to displaying a tap list of winter seasonal ales. He looks at home in virtually any environment, and if you act now, you can even pick him up at significant savings using the WHATADEAL discount code at checkout (ends November 25th). So what are you waiting for? Head over and introduce yourself. This entry was posted in More Than Just Green, Photo Display Products on November 21, 2014 by admin. Last Chance to Not Procrastinate! The time has finally come. 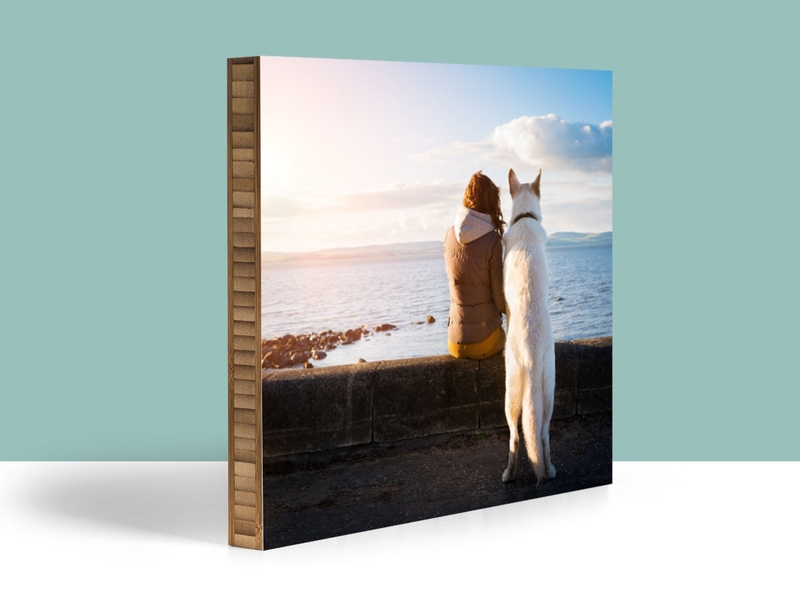 It’s your last chance to save big on custom picture frames from Plywerk. From November 19th through the 25th, our Procrastination Prevention Promotion enters its final, glorious stage: 20% off all Plywerk orders. It's the type of picture frame sale so good, it comes but once a year. So don’t delay. Shop early, shop often, and then kick back and relax knowing you got your holiday shopping done well ahead of time—and saved 20%. Remember, the Procrastination Prevention Promotion isn’t just a holiday picture frame sale; it’s motivation get your shopping done well ahead of time. You’ll save 20% and your sanity by shopping early, and that’s why this offer won’t last forever. You have from now until November 25th to navigate your mouse to this link and place your order. In fact, it really is that easy. With our optional Gift Your Order service, we’ll take care of everything for you; from the printing and mounting, to the packaging and shipping, and we’ll even include a handwritten note. Bam. You don’t have to do anything except send us a picture, and everyone will think you’re a holiday hero. Which, of course, you are. Okay, we’re not going to say it again, it really is the last chance to save 20%. Together, we can spread holiday cheer and put an end to stress-inducing procrastination practices; just order by 11/25! This entry was posted in Gifts, Holiday Gifts on November 19, 2014 by admin.